Just saw a posting from Southaven officials that the I-269 ribbon-cutting will be Friday, October 26 at 10:00am. Which end? I may try to go. The assumption of the Lamar Corridor Study was that I-269 would be completed by 2030 ... which certainly leaves open the possibility that I-269 could be completed well before that date. The project is broken into 4 segments. The 4th segment is currently under construction. The remaining 3 segments are anticipated to under construction in the next 2 to 4 years . The completion will be in phases ranging between 2014 to 2020. These dates are approximate due to ROW and utility constraints on the 3 segments not under construction. As far as the signing, it will be I-269/304 for the entire corridor. It opened to traffic sometime in the last hour. The Road closed sign in the MDOT camera looking South on I-55 at the loop to I-269 just came down with in the last hour or so. Watching MDOT workers pick up the orange barrels as I type (really slow Friday at work). Update: "I-269 NOW OPEN TO I-55" now posted on electronic signs. Any trailblazer I-22 signage on I-55 (in either direction) approaching the I-269 interchange? Approximately 200 people showed up for the ribbon cutting. The road itself was open just after Noon, though MDOT was still pulling down the black plastic covering the signs. Some overhead signs are still greened out, but I guess they'll fix that in a few days. 269 runs approximately 26 miles in Mississippi, with mileposts resetting at the Tennessee State Line. 269 reverts to TN 385 just north of I-40. I'm told TNDOT has signs on order and will finish the transition sometime next year. There is two state named shields for I-269 in Mississippi (not counting exit signs): MS 302 for NB 269, NB 269 just past 302. 269 in Mississppi is co-signed with MS 304 the entire route, ending st the state line. For those who asked, there's no I-22 signage along I-55. Now that's just plain stupid -- considering the time & money spent on upgrading US 78 to I-22. MSDOT will be getting a very pointed email within a few days! 69 reverts to TN 385 just north of I-40. I'm told TNDOT has signs on order and will finish the transition sometime next year. Has I-269 been approved for the northern segment of 385? I thought AASHTO had only approved 269 up to I-40. 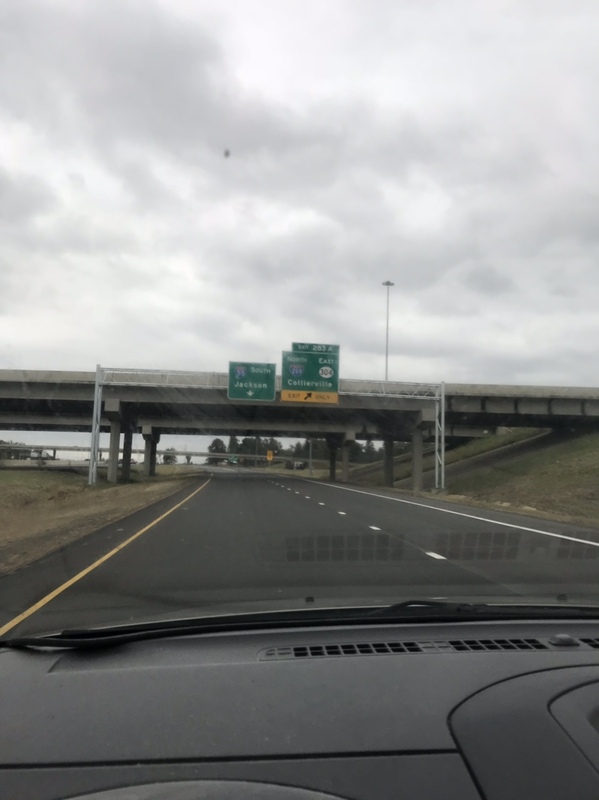 When I asked the relevant TDOT engineer about 385 last year, they were reported to be planning no changes until there's an I-69 to connect to, which seems to be many years away. Agreed, in the Cincinnati area I-275 is marked with the next interstate or major highway in each direction. Considering what ODOT is doing to I-270, around C-bus; don't expect to see any control cities, routes, or destinations, on I-275 much longer. INDOT does not sign I-69 from I-70 near Indy either. Of course with I-69 soon to be on its eastern end of the 465 loop that will change, but do not count on control cities. I suppose that change will only affect the interchanges in Ohio; those in KY would stay the same? If those follow the "next trunk Interstate junction" standard as controls, there would be the oddly ironic situation of I-71 being the control for CCW/outer I-275 at its KY junction with, well, I-71! Somehow I doubt that's the actual case! I'm sorry if I missed it, but does anybody know what control city is displayed for I-269 NORTH for drivers who are southbound on I-55 coming out of Memphis. I would hope it's Birmingham or Tupelo. But given the above discussion about the lack of I-22 trailblazers, I'm guessing it's Collierville. Along US 78, 269 is posted for Collierville. When I was there Friday, everything along I-55 was still greened out for 269/304. Google maps is now showing I-269 as open. The map on my iPhone is also showing it as open. I hate to say it, but do you know how Google knows? When Android phones start traversing the route regularly that is on a lat-long not recorded in their maps database. Throws out an exception because people are now driving where they (Google) had no road before. This is also how Google "knows" a road reopens. Another way is Google Maps will throw up an alert asking if the way you traveled is open. This happened to me during the Meramec River flooding which caused I-44 to close temporarily. Maps still showed the road closed, but it had just been opened by MoDOT and Maps pinged me to validate that the road was in fact open. About 15m later the closed symbols on maps fell off. The amount of data Google collects is pretty astounding, especially on road use. This is probably the last new stretch of Interstate highway to open in mid-America for a while. Based on the few pictures I can find, it looks like MS handled the I-22/269 interchange kinda barebones regarding lighting and signage. Wish I could find some pictures with signage besides the END/BEGIN I-22 signs. Gantries, etc. Let's hope that statement is incorrect as regards the I-49 MO/AR Bella Vista connection -- at least in the near term. Moving forward, there's the other MO/AR connection, I-57, and somewhat north of I-269 itself, parent I-69, or at least the portion from KY south to I-155. Curiously, those three projects cross state lines at approximately the same basic latitude! Other than those, pretty much everything else in the region is way down the line! Could you share the exit numbers you observed? I'd like to be incorrect, but funds seem to be the sticking point for all the states involved unless one of them in particular for 2 of those roads votes next week to tax themselves like we did in a few years back. If we can do it here given our GDP, then there's hope that others will see the light as well and invest in their infrastructure. I didn't include control cities here, but can provide what I have if needed. Side note: Tennessee has 2/10 mile markers on 269, Mississippi doesn't.